this app is for you. The app’s developers are one the first to incorporate Apples M7 motion coprocessor, and does so magnificently. 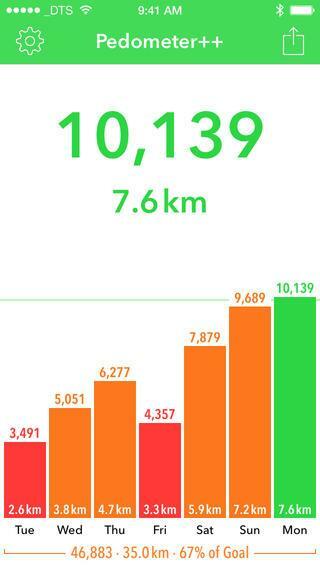 Pedometer++ also allows you to set yourself step goals each day for those who enjoy to challenge themseleves. If you’re after a full package fitness app, look elsewhere. This app is focused on ensuring tracking your fitness is a breeze and doesn’t try to be something it is not. If you’re the kind of person who has to go to a lot of conferences, meetings, events etc, you probably have to sit through a lot of power point presentations. For most you’ll probably wish you were anywhere but sat in front of the presentation. However what when you see some power point slides with some valuable information on them? You take out your smart phone and take a picture. But what if you’re sat on the other side of the conference room and your phone can only pick up what’s closest to you? You miss the valuable information and it is infuriating. Now YouCam Snap, (if you hadn’t already guessed) de-skews the image and saves it as a PDF directly onto your phone. The result is a perfect image of the power point slide, as if you’d downloaded the original slide. A game changer. In recent times the world has been shaken by privacy scandals which has seen the rise of anonymous and private messaging apps. We seem to be in constant fear of being spied on by someone or other, this has seen the rise of mobile apps like Snapchat which allows you to send images with a timer before they are deleted. Silent Text 2 is the messaging equivalent, you’re able to send messages and attachment (encrypted if you so wish) to silent circle account holders which requires a paid subscription. Like Snapchat you can decide how long you’re receiver can view your message but Silent Text 2 goes one better by allowing users to remotely delete any message they’ve sent from a receiver’s phone. If you’re someone who values their privacy and are convinced you’re being spied on this app is match made in heaven. Another app for the business men and women out there. This app is simple, you have a physical document that you wish to send without having to figure out how to work the scanner. 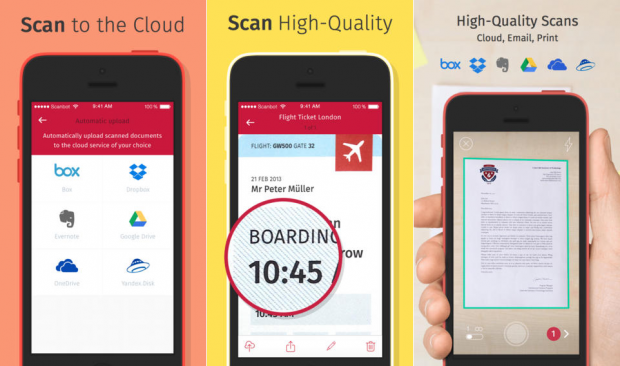 Simply take a picture of the document in question with Scanbot and the application will convert the image to PDFs or JPGs with 200 dpi or higher resolutions. Thus, leaving you with a high quality image so which can also be uploaded to various cloud storage systems. This just makes your office life a bit easier to manage. You know how Apple insists on having multiple mobile apps for your email, calendar, and contacts? Well, if that drives you up the wall, Acompli Email & Calendar might just be your life line. The app has centralised those three apps into one, it also boasts Microsoft Exchange, Office 365, Google Apps and Gmail accounts. The app is very pleasing on the eye and offers an “easy files view” which shows the user all the files shared with their contacts. Makes managing a ton easier. Another privacy focused app makes the list, this time it doesn’t enable you to hide from snooping governments but from ‘friends’ you’d rather avoid. We’ve all been there when you see someone you know approaching and you try and look at everything but at their piercing eyes. This app is designed to stop those awkward moments. The app even has a “hate follow” feature which allows you to follow people you hate on geolocation sharing websites, just so you can ignore them in real life! If you hate people, you’ll love this app. The Week is the perfect app for keeping up to date with all the important news of the week. In an age where we find ourselves with less and less time this app is a god send if you don’t get a chance to actively search for news. The app has one of the best designed interfaces to boot and is easy to use. It’s design is only enhanced when using it on an iPad, giving it a true newspaper feel enhancing its value. The only down side to the app is that it does require a subscription for full access, but it does include a 14 day trial once downloaded. Recently the app has added a ‘Daily Briefing’ feature that includes the 10 most pertinent facts about the day. A great app to view your news efficiently. This app is for the hardened mathematicians out there. There are plenty of calculator applications which are great if you’re having a slow day and need to work out some simple calculations. However, they’re not so simple when you start having to input powers, roots, and exponentials (7², √, ∛, e³). MyScript Calculator allows you to draw maths equations with your finger and then converts it into digital text and gives you an answer at the same time. An end to fussy and daunting mathematical equations. As our world gets smaller and smaller and foreign countries become more accessible through technology we are faced with more languages and cultures. It used to be if you wanted to learn a language you would have to find a language school or buy a brain numbing language book. Now there’s an app for that, Duolingo to be exact. The app acts like a game almost, allowing to track your progression and to achieve set milestones. The app also found and ingenuitive way to bypass the classic “your app is free so heres a shedload of adverts” by using the lessons you take as a way to translate real world texts in the language you’re learning to translate web texts. The app is also scientifically proven to be more effective than some university language courses. You never know when you’ll need one, but you know you need one. Vert 2 is a unit conversion app boasting over 900 units (everything you could possibly imagine) but most notably clothes sizes! This is its strong point, as other converter mobile apps focus solely on the basics; currency, imperial to metric or shoe size. If you travel a lot and can’t keep up with all the different measuring units in the world this app is a must.